Radical psychoanalysts; a medieval corn mill; a stairless Paradise; and more hairdressing salons than you can shake a freshly-cut daffodil at. 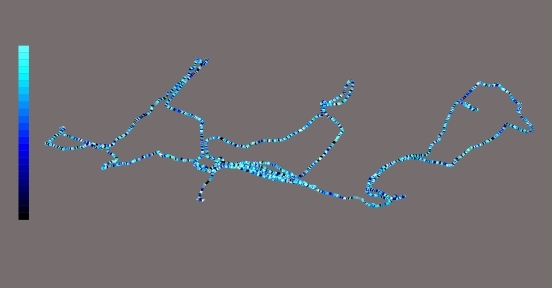 A Road Trip for Longbridge starts and finishes with the regeneration works on Longbridge Lane but in between goes on a journey to a variety of locations in Hollymoor, Frankley, Rubery and Rednal that pose questions about ideas – and ideals – about the places we want to live in. Part guided tour and part guided conversation, it is an invitation for you to share your stories about your experiences of community and the changes in the area. Booking is not entirely necessary, but there’s a sign-up form here which would help Cycle South Brum immensely. Where/when does it start and finish? The tour starts and finishes at Austin Park – behind the new Bournville College building on Longbridge Lane. Go into the shared space area as if you were going to Sainsbury’s, then turn right in front of the hotel and pub. We’ll be the ones with the bikes in the corner! Please make sure you’re ready for a prompt 11am start. 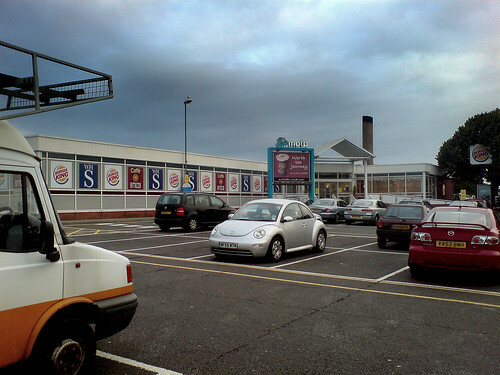 There are loos in the nearby Sainsbury’s supermarket if you need them beforehand. There will also be a feeder ride for people who would prefer to start from Northfield. Meet Cycle South Brum at the multi use games area in the middle of Victoria Common. This group will leave at 10:30, so please make sure you are there and ready to depart by then. Is it far? Is it fast? Will I be able to keep up? The route is about 10 miles long in total, but there are several stopping points, so you’ll not need to cycle more than a few miles at a time. We’ll go at the pace of the slowest rider, waiting for everyone to catch up after uphill sections etc. We’ll also have a ‘Tail End Charlie’ whose job it will be to stay at the back of the group and make sure no-one gets left behind. If you find you need to walk up a hill, that’s totally fine. Will we be cycling on busy roads? Yes. 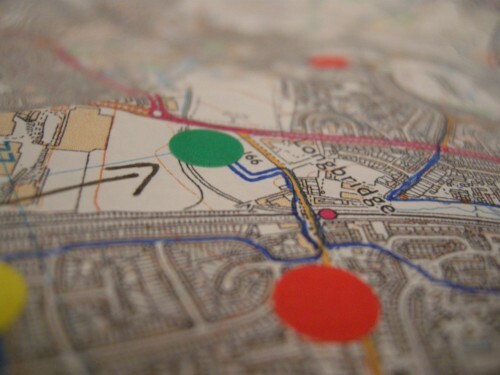 Although some of our route is on off-road cycle paths and National Cycle Route 5, the majority of the tour will be along roads – sometimes busy ones. Because of this the tour is not suitable for children or for very novice riders. You don’t have to be a pro road racer with all the kit, but we do request that everyone taking part should be comfortable cycling on the road in amongst other traffic. Will we stop for lunch? Do I need to bring anything with me? There’ll be a lunch and toilet break at the Hollymoor Centre café. Please bring a lock so you can leave your bike outside and some money. It would also be wise to bring some water to drink as we’re cycling around and of course clothing etc suitable to the weather (waterproof layers or sun protection, depending on which way it goes!). There’s a chance for another loo break later in the day at Rubery. Cycle South Brum have a few cycles available for hire. 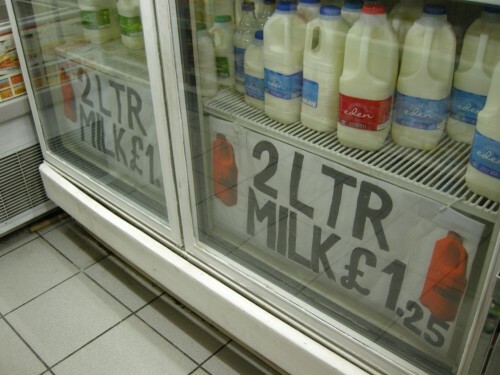 You will need to arrange this with them in advance. Will the tour still take place if it’s raining? Yes …up to a point. If it’s drizzly we’ll still ride. If the weather’s shockingly bad we’ve pencilled in the next Saturday (24th of May) as a Plan B. Cancellation notices will be posted here. I really want to take part, but I can’t do the bike ride. Is there an alternative? Yes! We’re also running a minibus version of the Road Trip on Saturday the 26th of April. Places are limited, so you need to sign up here. No, sorry, all the places for the minibus version have been taken! Use the contact form and we’ll do our best to help. Go get yourself signed up! This event is supported by Cycle South Brum. Check out their website for information about bike hire, events and training. 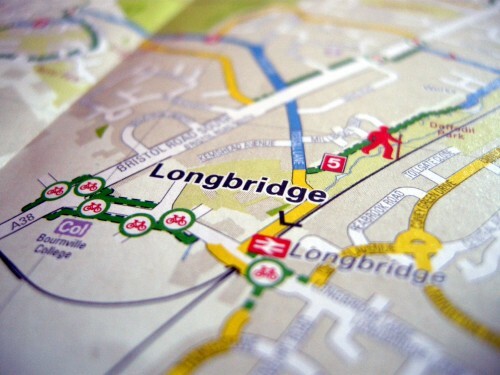 A Road Trip for Longbridge is available in two flavours: minibus and pedal-powered. 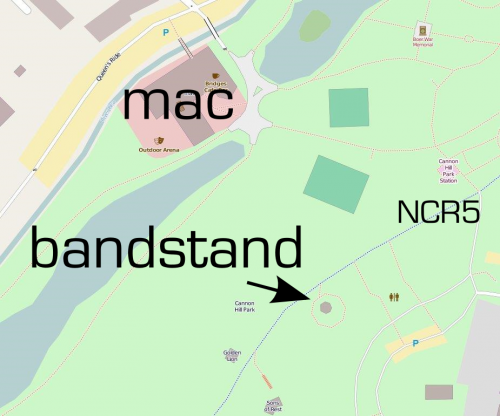 Both events are free and start and finish at Austin Park (behind the new Bournville College building). Also on the 26th of April there’s a Supper Club (includes a free meal) event 6-8pm at Longbridge Methodist church hall. Reserve your place here before the 21st of April. Run in partnership with Cycle South Brum. Sign up here. 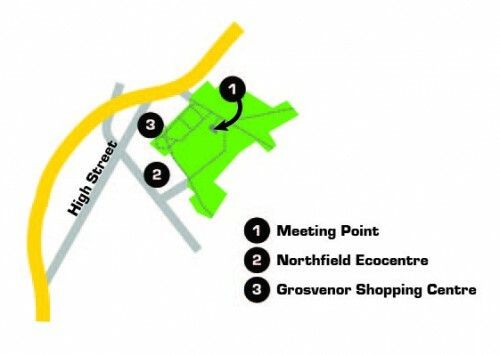 Bring a bike and meet us at Austin Park at 11 (or at Northfield Eco Centre at 10:30). Yesterday I joined forces with Hannah Hull to provide a special, for-one-day-only, free public art service for Longbridge as part of our commission for EC Arts. 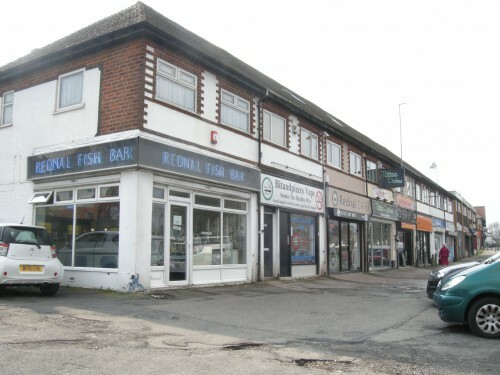 We struck out down the Bristol Road and found a parade of shops that seem to have been passed by by all the regeneration efforts several hundred metres away and decided it would be nice to give them some attention. 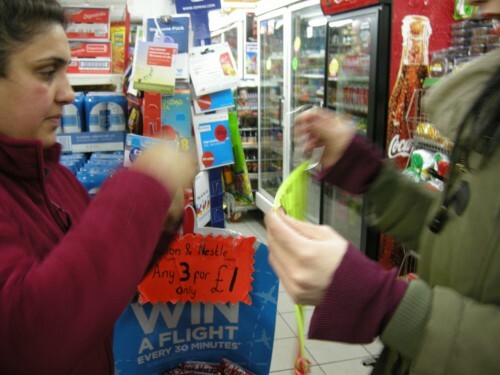 We went into several of the shops introducing our art service and offering to provide creative services, be it drawing, painting, sculpture, performance or socially-engaged interventions. After more or less discussion, some of the shopkeepers came to the conclusion that they were not in need of our services. We asked them to fill in an entry in our receipt book to certify that “no art is required today”. For some, this was because they saw no need for any additional art in their life, or because they did not feel qualified to be able to make the decision themselves, instead asking us to return when other family members would be present. Next to him was sat a young woman sketching out a Jack-Nicholson-as-the-Joker portrait for what we think was going to be a calavera sugar skull. 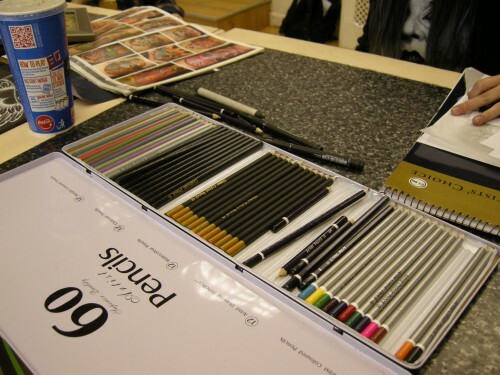 We were quite envious of her pro pencil kit and putty rubber. 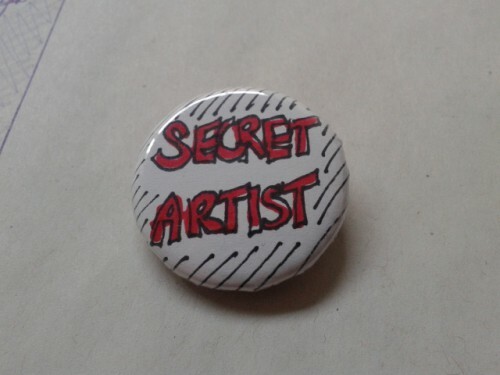 Next time you’re in a shop in Longbridge, have a think about the person serving you and wonder if they’re really a secret artist. Of the official commissions we received, there was a strong signage theme. 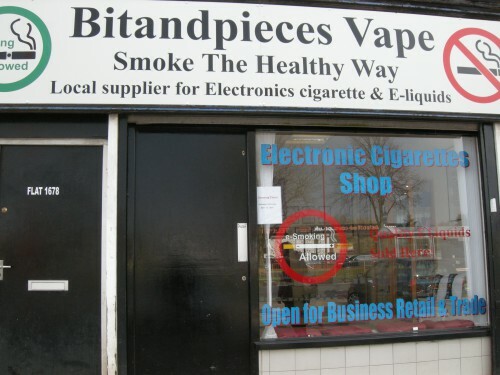 The man in the electronic cigarette shop is unhappy with his boring black front door and wants to paint it up so it’s more catchy. We measured the door and then sketched out a few different approaches he might consider. 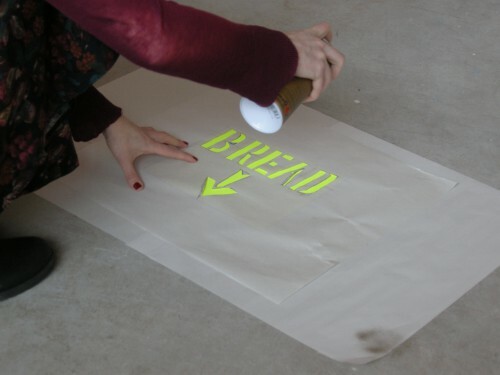 Unfortunately we didn’t have much in the way of paint with us, but what we were able to do was set up a potential link with a student at Bournville College who’s interested in doing some graffiti-style work. We all thought this could be a nice pairing! The man in the tool hire shop requested some designs for a mural on his outer side wall in a style not entirely dissimilar to the signs that could be seen around the shop counter. With added tool-based word play. 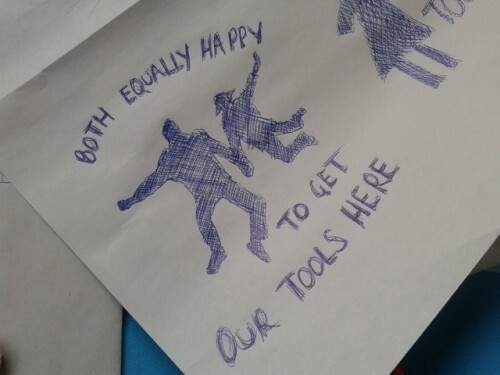 We suggested that this might be a bit sexist and sketched up a few variants on the theme that were more encompassing of other types of relationships and gender identity. 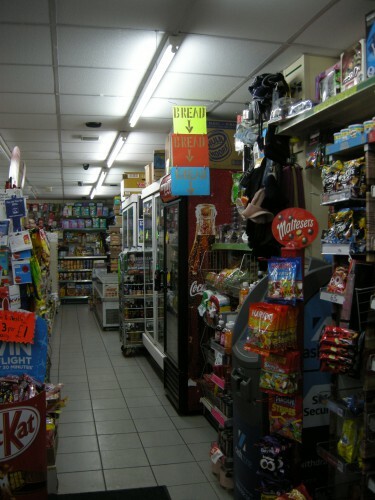 Perhaps our most successful commission was completed for Mandy in the convenience store. 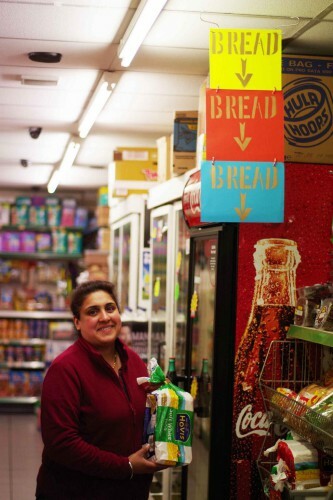 After a bit of a chat we discovered that she was quite frustrated at always having to direct customers towards the bread. 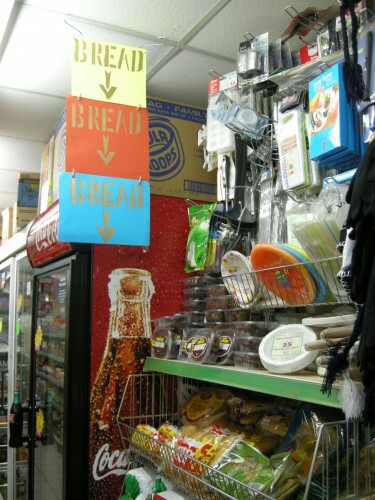 Finding the milk often seems to be problematic too, but we really liked the signs she’d made for the fridges and so we decided to concentrate our efforts on bread wayfinding. 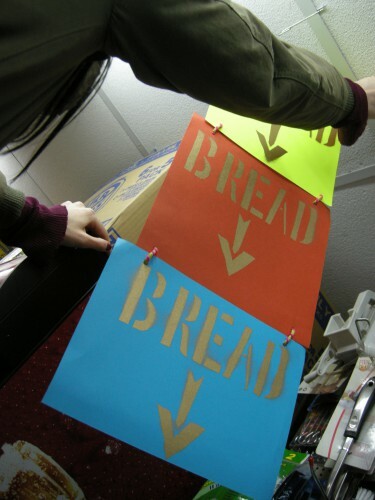 After checking how the sign could be hung from the ceiling, Hannah used her stencilling skills to put together a rather eye-catching three-tier bread sign. 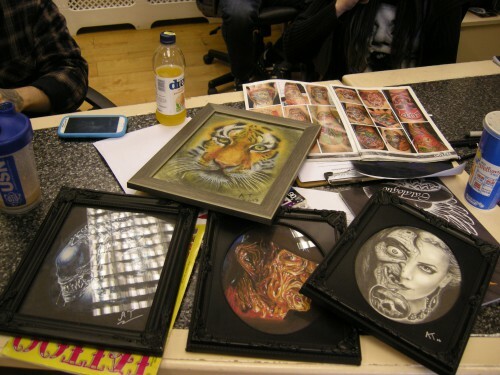 All commissions were documented via report sheets detailing client details (name, age, ethnicity); description of art services provided; duration of art service; venue of art service and whether the art service made people happy. We had a 100% success rate with that last one. Austin Park, with Bournville College in the background. I’ve been working with cultural planner Jenny Peevers to find a way to harness the Road Trip I’ve been developing as part of my Longbridge Public Art Project commission so that the conversations catalysed though it can be more effectively turned into actions. As a result, we’ve linked two of the Road Trip events to two Supper Club meals that Jenny’s organised as part of a larger series. …an exchange of food, stories and future possibilities. We bring the food, you bring the stories. So, on the 5th and 26th of April, you can spend the afternoon with me touring different corners of Longbridge and the surrounding areas looking for new angles on the theme of community, and then segue smoothly into a meal and some activities designed to identify what changes people would like to see taking place in Longbridge over the next few years. Road Trip + Supper Club combination, 5th of April, starting from Reaside Community Centre. Road Trip + Supper Club combination, 26th of April, starting from Longbridge Methodist Church Hall. For those of you who would like to take part in the Road Trip but not the Supper Club events, there is a Road Trip only taking place on the 29th of March. Sign up for your place on the minibus here. Our conversation (although not necessarily the journey itself – check the sign-up pages for starting locations!) 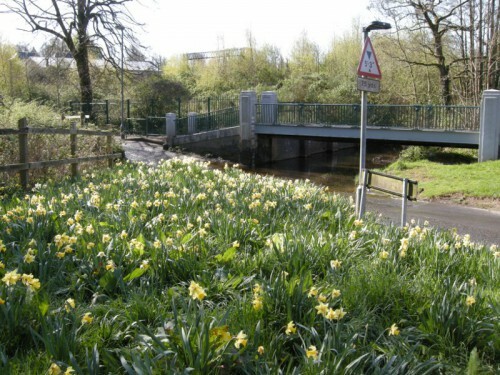 will start at Austin Park where the River Rea has been ‘realigned’ to look more natural. Our effect on our surroundings and our surroundings’ effect on us will be a recurring theme throughout the day. Join us and add your feet and your voice. 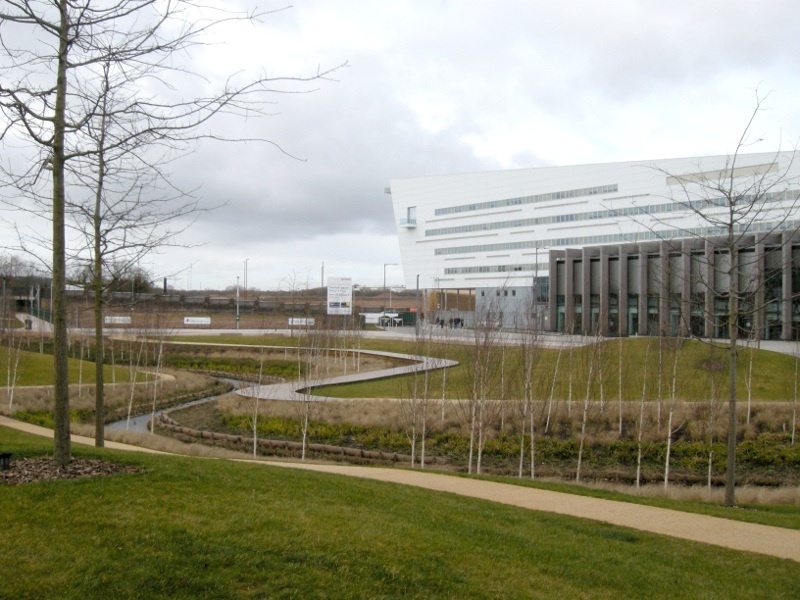 As part of my research for the A road trip for Longbridge guided tour, I’m keen to hear your stories, anecdotes and interesting facts about places on the route. Apparently one of the oldest service stations of its kind (opened in 1966) Frankley Services must have seen some interesting things. Have you? Can you tell me about something that happened here? A rural church a stone’s throw from Frankley Reservoir. I hear it’s really popular for weddings. Can you tell me anything about it, or perhaps describe why you chose to tie the knot there rather than anywhere else? 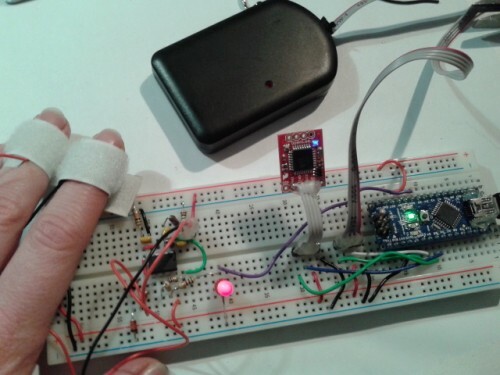 If you’ve got something to share, please add it to the comments for this blog post. 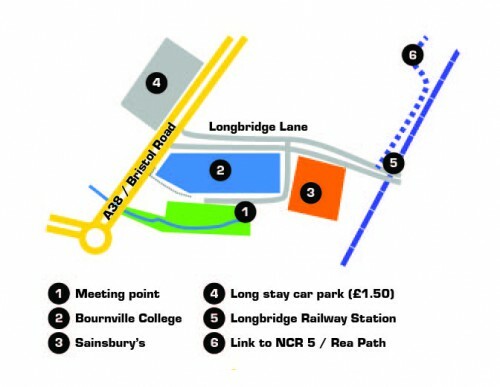 As I mentioned recently, I’m one of a cohort of artists and other practitioners involved with the Longbridge Public Art Project (now with its own website). Following those first explorations on foot, Colin Corke (vicar at St John the Baptist, former chaplain at the Longbridge car plant and general Austin/Rover aficionado) was kind enough to give me a motorised tour of the area. We talked about communities, places to gather, places to get away to, landmarks, things that aren’t there and, yes, maybe a bit about cars too! I found this a really eye-opening way to think about Longbridge and, as a result, I’ve decided that my main project for the residency will be to develop a guided tour taking in a selection of locations that relate to the themes of community, roots, travel and flows. A road trip for Longbridge. I’m working with local residents and staff and students of Bournville College to pull together the content for the tour. 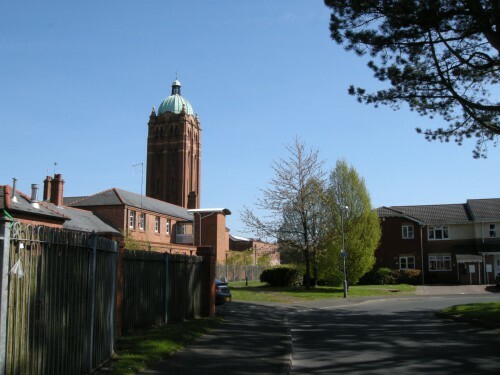 See this post for my first request for stories about Frankley Services and/or St Leonard’s Church. 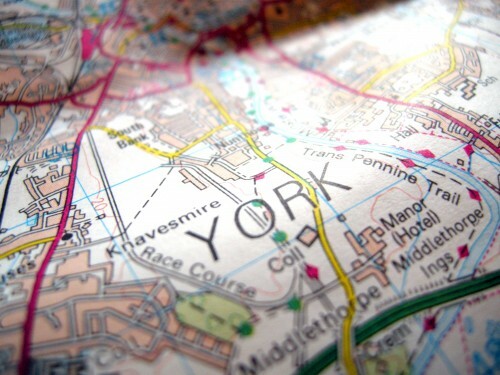 The draft route is currently weighing in at about 25 miles, so I think I’ll be researching mini-bus hire in the near future too!